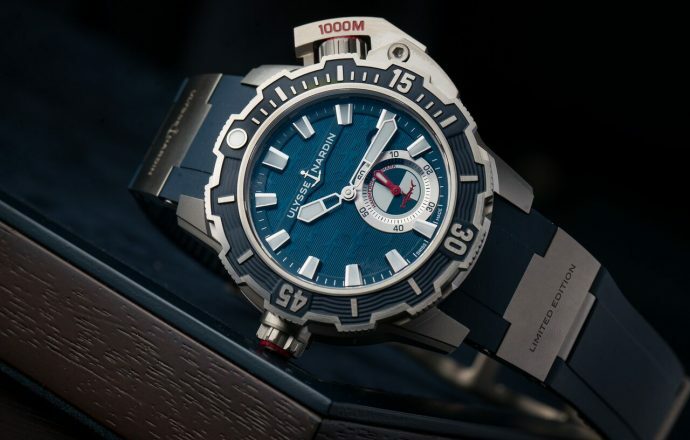 As a brand, Ulysse Nardin has a strong connection to the oceans. This is not only evident from the many nautical watches in their collection, but also from their diving collection. With the Diver Deep Dive, they now go even further, offering a watch with a water resistance of 1.000 meters. 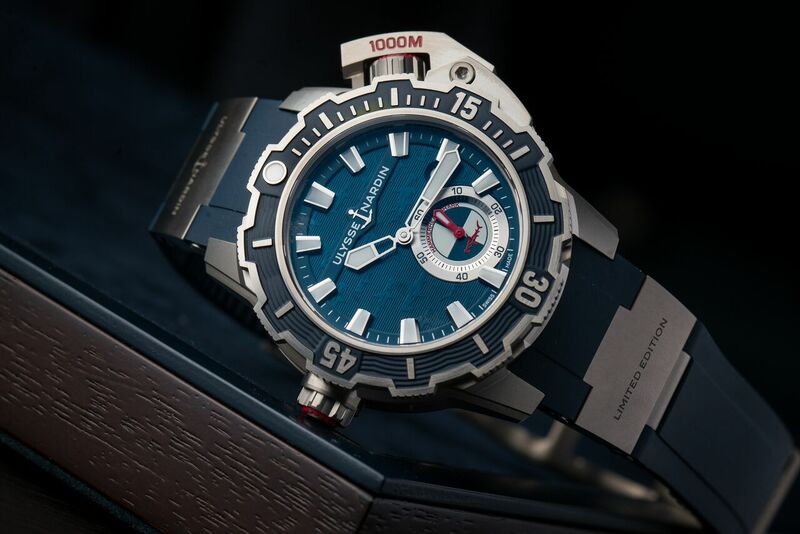 While this water resistance seems somewhat of an overkill, as this is a depth no human has ever been to outside of a submersible, the Ulysse Nardin Diver Deep Dive meant business and was specially designed for prolonged deep dives and saturation diving. Its design is dominated by the guard crown at two o’clock. While an important safety feature, and an impressive looking one for that matter, it is positioned in such a way that the watch is actually, comfortable to wear. Also, Ulysse Nardin’s metal of choice for this watch, titanium, helps to make it a pleasant, daily companion as it keeps the weight of the 46mm large watch down. 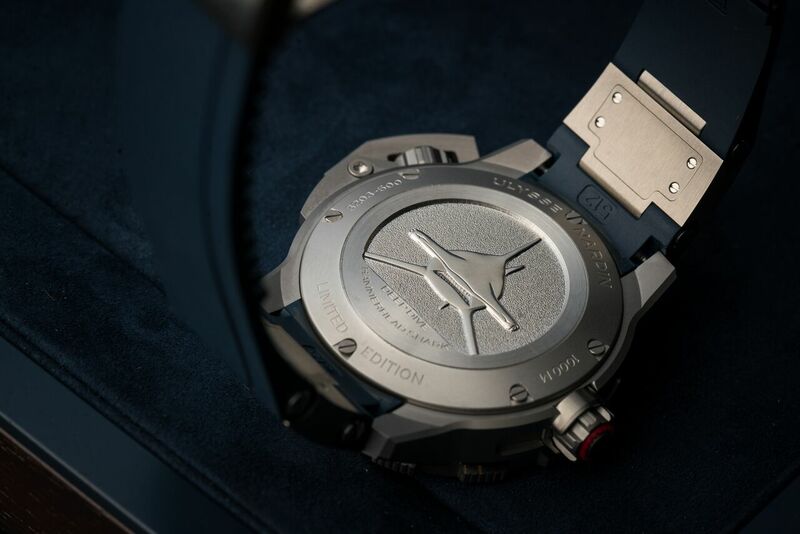 Protected by this titanium case, which is on the left side also fitted with an automatic escape valve from when diving in helium-rich environments, is manufacture caliber UN-320. Fitted with a silicium spiral and anchor escapement it is a very modern caliber, yet one that at the same time respects the traditions of Swiss watchmaking. That is also one of the unique hallmarks of Ulysse Nardin, at one side they are very avantgarde manufacture, yet one with a history that goes back to 1846. Of course, is the Diver Deep Dive fitted with a unidirectional diving bezel. As is tradition with Ulysse Nardin is it partially covered with rubber, to make it even easier to turn, with or without gloves. The strap, with the titanium inserts, is another hallmark of the brand, yet they also incorporated an expandable element, that consists out of a spring that adjusts according to the watch depth, making it always fit perfectly over your neoprene diving suit. The mascot of this watch is the hammerhead shark. This distinctive sea predator adorns not only the dial but is also stamped in the case back of this watch. 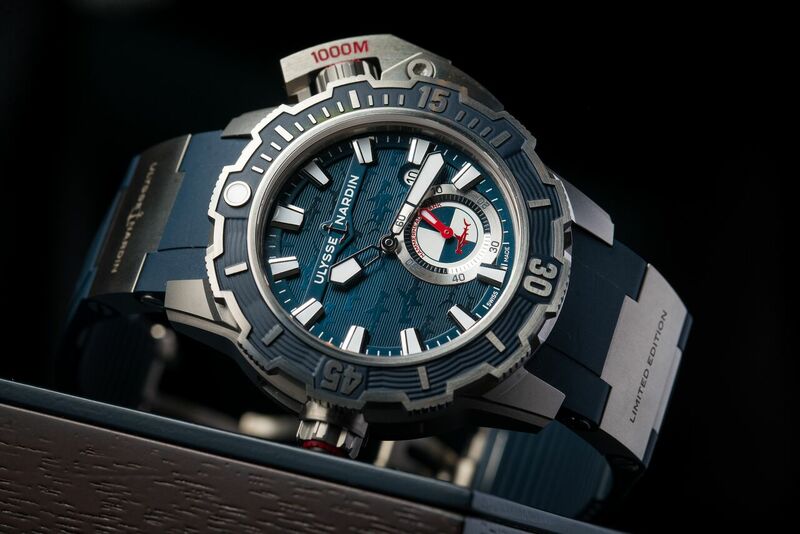 Ulysse Nardin will make 300 pieces of the Diver Deep Dive.